The Applesauce Inn…the name alone hints at the warm welcome that awaits guests here. 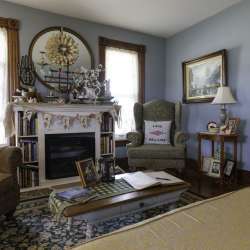 This vintage farmhouse, once part of a working farm and its apple orchards, is the perfect escape for couples seeking a relaxed, yet rejuvenating getaway. 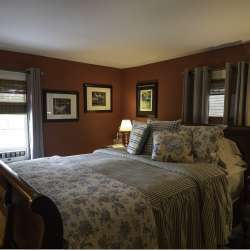 The Inn sleeps six, with three rooms total, adding to its cozy charm. Guests will appreciate the gracious porch that surrounds the house, offering plenty of opportunities to kick back and breathe in the clean country air. Of course, guests can also opt to explore the many nearby attractions and activities. The Inn is centrally located just outside downtown Bellaire, a burgeoning community with popular dining spots, including a landmark brewpub that features live music. The Inn is also situated on the Chain-of-Lakes, a 75-mile long waterway offering opportunities to explore the area via pontoon and kayak. 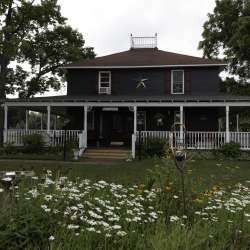 Guests wanting to explore further are a short, 45-minute drive from Traverse City, offering a variety of dining and shopping options, and other attractions.